How Does GO X-24 Printer Compare to 24-inch and Under Ecosolvent Printers? 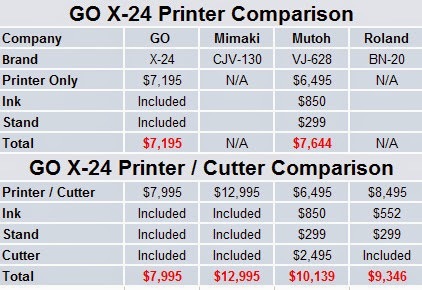 The GO X-24P (printer only version) is now shipping and we have had a number of customers ask about the differences between the X-24P and printers available from other manufacturers. As you will note in the chart, the only other strictly printer model in the market is the new Mutoh ValueJet VJ-628 ecosolvent unit being sold by Sign Warehouse as the PrismJET VJ24 24" Ecosolvent Printer. 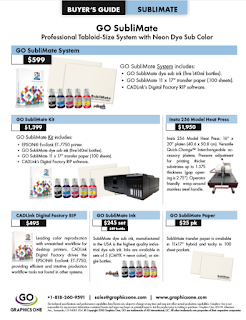 SignWarehouse offers very good bundles on their other products and no doubt they will do the same with the ValueJet VJ-628 ecosolvent printer. -The GO X-24P all inclusive price, including ink and stand, is $7,195. Mutoh's VJ-628 is $7,644 including ink and stand. -The GO X-24 is on the only 24-inch printer in the market that can be upgraded to a fully integrated all-in-one printer / cutter. Buy the printer and upgrade to include the integrated cutter later. -If upgrading the X-24 to fully integrated Printer / Cutter, the total price, including ink and stand, is $7,995. Upgrading the Mutoh ValueJet VJ-628 to include the Mutoh ValueCut 24-inch cutter totals $10,139. In comparison the Mimaki CJV-130 is listed at $12,995 and the Roland BN-20 at $9,346, substantially higher pricing. -GO's EcoColor ecosolvent ink is priced at $45 per 220 ml cassette, whereas Mutoh's ink is $69 as is Roland for 220 ml cassettes. With Mimaki at $129 for 440 ml cassettes, GO offers a substantial savings in daily operational costs. The GO X-24 offers tremendous operating value and is the first printer offered which has the capability to be upgraded to an integrated all-in-one printer / cutter.